Union Pacific Railroad reported first-quarter net income of $1.3 billion, or $1.68 per share, compared with $1.1 billion, or $1.16, in the first quarter of 2017. The Omaha, Neb.-based railroad generated operating revenue of $5.5 billion, a 7% rise from $5.1 billion the same period a year ago, due to volume growth, increased fuel surcharge revenue and pricing gains. The operating ratio was 64.6% in the quarter, down 0.6 point from a year ago. Higher fuel costs negatively impacted the ratio by 0.2 point. The per-gallon average quarterly diesel fuel price was $2.13, a 22% rise from $1.75 in the first quarter of 2017. The railroad consumed 267 million gallons of fuel, up 6%. The railroad breaks its revenue into four major product segments — agricultural products, energy, industrial and premium. The agricultural group saw flat freight revenue of $1.1 billion as its revenue carloads dropped 4% to 279,000 and average revenue per car grow 5% to $3,942. The energy segment saw freight revenue rise 15%, to $1.2 billion from $1 billion, revenue carloads grow 6%, to 419,000 from 395,000 and average revenue per car rise 8%, to $2,799 from $2,593. The industrial group reported its freight revenue rose 6%, to $1.3 billion, revenue carloads rose 2%, to 411,000 from 403,000, and average revenue per car grew 4%, to $3,262 from $3,140. 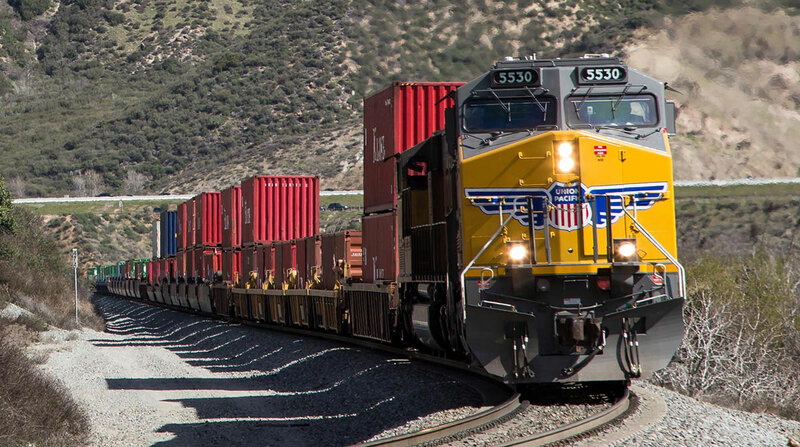 The premium unit reported a 7% rise in freight revenue, to $1.5 billion from $1.4 billion, revenue carloads grew 2% to 1 billion and average revenue per car rose 5%, to $1,487 from $1,413. Union Pacific operates in 23 Western states.